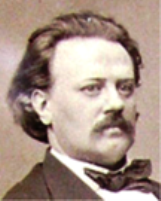 Ludvig Norman's String Quartet in a minor, Op.65 is counted as his fifth string quartet and occasionally as his sixth. It was most likely his last, completed and published in 1884, the year before his death. His schooling at the Leipzig Conservatory is still on display as the work shows the influence of both Schumann and Mendelssohn, the models which were held up to all the students there at the time as worthy of studying. The big opening movement, Allegro agitato, has a broad sweep, and considerable forward energy as evidenced by several episodes of rushing passage work. A lovely, prayer-like Andante sostenuto e cantabile is a Mendelssohnian song without words. The Tempo di Menuetto which follows is a rather romantic take on the classical form. The finale, Allegro molto vivace, is for the most part upbeat and in the major. Long out of print and unavailable, we are pleased to present it once again. It would do well in the concert hall and is also a good choice for amateurs.